I met Ryan and Samantha (and their cute little doggie friend Mickey) of the Gone Vananas vlog when we worked together in a remote National Forest campground. I could tell almost immediately after meeting them that they were both hard workers serious about doing a good job. As the weeks of our employment passed, I also found them to be funny, kind, smart, and generous. They had been vandwellers for just shy of one year when I sat down with them to talk about choosing a rig, getting along in close quarters, what they miss about their old life, and what they love about their new one. Rubber Tramp Artist: Whose idea was it to hit the road? Ryan: I think it started with me. I had a conversation with my best friend about a co-worker of his that decided to quit his job and sell all of his stuff and move into a van and then go do chairlift work out in Colorado since he was a big snowboarder. That got the gears turning for me. I started doing all kinds of research on how that would look for us, what kind of van I could possibly build. Once I had enough information, I approached Samantha about it to see what her take was on it. RTA: [to Samantha] How long did it take him to convince you? Samantha: Oh, not long. [Laughs] I’ve lived like a nomad most of my life. I’m 32, and the van is my 35th home. Samantha: No question. Ready to go! Let’s do it! RTA: What’s the make and model of your rig? 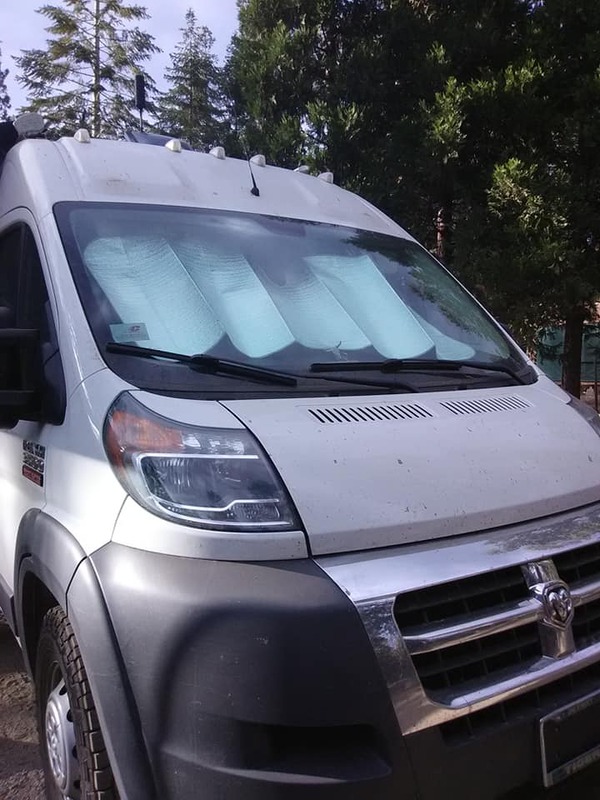 Ryan: It’s a 2016 Ram Promaster 3500 extended. It’s the biggest one that they make. RTA: Why did y’all choose this rig rather than a typical cargo or conversion van or a minivan or a big motorhome? This is the independent bathroom Ryan wanted. Ryan: My grandfather is retired Chrysler, so we got his employee discount on this brand, which helped a lot. I wanted something that had enough room to comfortably live two people, and I’m 6’2” so the ability to stand up in it was really important to me. I also wanted an independent bathroom. When I added all these things up, and looked at the dimensions of all the vans that were out there, this one made the most sense. RTA: Why a van rather than a motorhome? Was it primarily because of the discount that you were able to get? Ryan: The primary reason was I wanted to build a rig that was stealthy and easy to maneuver in normal parking spaces and normal roads and situations. I considered a school bus conversion for only a short while. The cons of that—not being able to stealthy camp in a neighborhood and limited parking spaces—kind of shot that down for us. We wanted to camp for free essentially everywhere just by camouflaging ourselves in normal areas. RTA: What was the most difficult thing for each of you to give up when you left your conventional life behind? 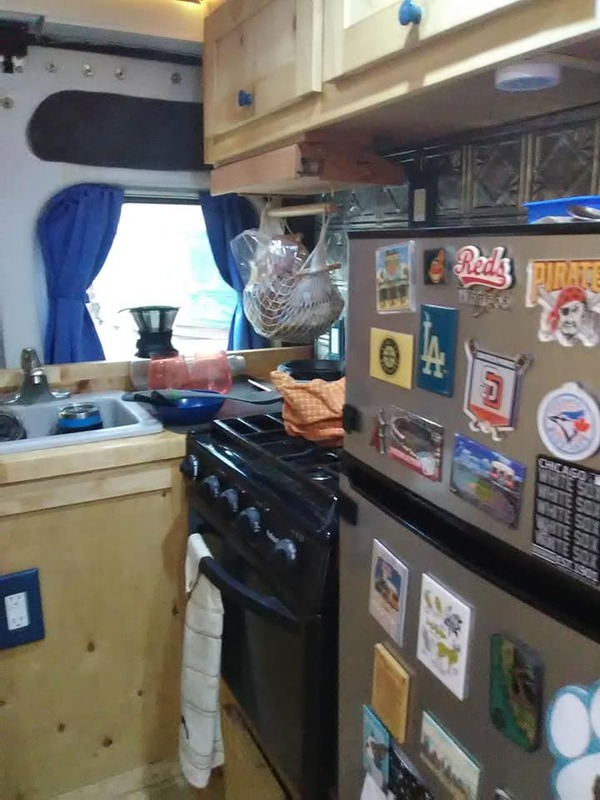 The full kitchen in Samantha and Ryan’s van. Sink. Check. Stove. Check. Oven! Check. Refrigerator. Check. hundred dozen cookies come the holiday season. That was tricky, but Ryan was able to give me a full kitchen. I can basically do everything in there that I can in a real kitchen, with much less space. RTA: And so what about for you, Ryan? Ryan: I have to say, I was really fond of my muscle car. It was my project car. It was kind of my baby. I loved having that, but at the end of the day, it was just a thing. I didn’t mind selling it because I really value traveling and experiences over stuff. It was kind of just going through the motions of being upset about it when I sold it. RTA: What kind of car was it? Ryan: It was a 2014 Dodge Challenger that I put a lot of time and effort and money into making it my own and looking really nice. [Chuckles] It only had 8,000 miles when I sold it. RTA: Do either of you ever feel like you can’t spend one more minute in the van with the other person? Samantha: Yeah. Just shy of a year? Samantha: We’re coming up on a year in the van. 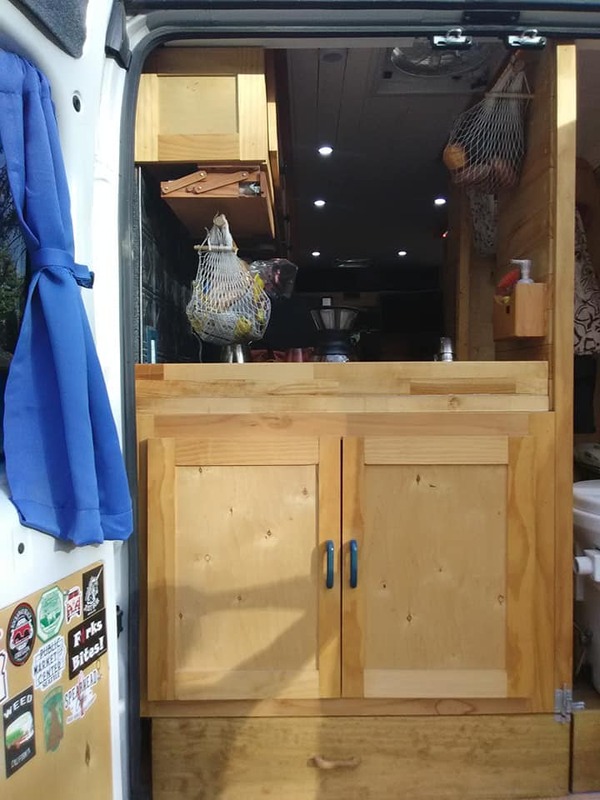 View of the kitchen from outside the back of the van. You can see a sliver of the restroom on the far right of the photo. 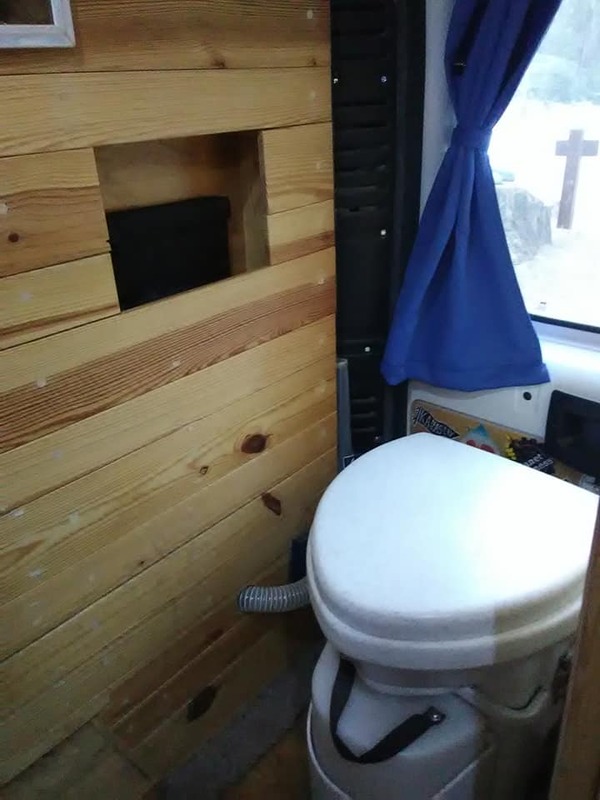 RTA: I’d like for each of you to tell me three traits that the other person has that makes for a great vandwelling partner. Ryan [to Samantha]: You wanna start? Samantha [to Ryan]: No. You start. Ryan: Well, I would say one, Samantha is, I guess, what they would call a low-maintenance girl. [Laughs] She definitely isn’t very needy. She doesn’t have to have all the big, expensive stuff and house and car and all that things that…you’d hear other people need. She’s very go-with-the-flow. I guess that would be another one. Not a lot rattles her. She’s adaptable. She basically will get along with any situation. She won’t freak out if…things are going a little bit south or we don’t have a plan or something isn’t going the right way. It’s kind of tough to rattle her. Those are important things, I think. Samantha: Ryan is very well organized and always has…some kind of plan. He knows where we’re going or what we’re doing or how we’re going to get there. [Laughs] And he is good about keeping us in minimalism. 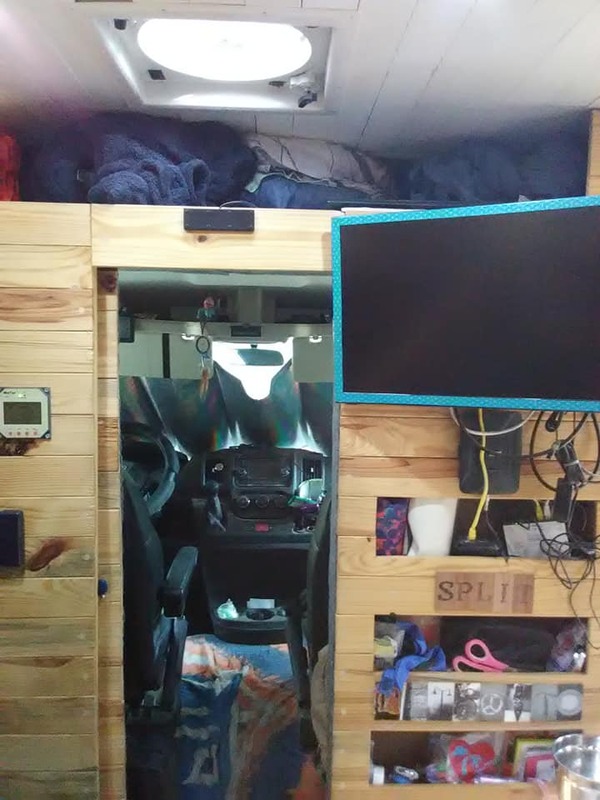 If it doesn’t have a home, it doesn’t get to come on the road with us, it’s got to have a place to go in the van. [He is] keeping us from acquiring too much more other than necessities…Also he is very handy. If something goes wrong he figures it out very quickly and fixes it. So far we haven’t had too much trouble, but the few things that we’ve come across, he’s figured it out and knew what to do and what he needed to do it and got it done right away. Ryan: A lot of repairs in the Home Depot parking lot. RTA: So y’all are quite a bit younger than many other rubber tramps. What do you plan to do with the next 40+ years if you’re essentially retired in your 30s? Ryan: We have talked a lot about that. It’s been a fluid plan as far as maybe tweaks and changes here and there. The main part has been we would like to purchase land. Where that is necessarily has changed. Right now we are considering Southern Oregon. We would like to have around 10 acres, maybe build a tiny house on a trailer, have a workshop and also a garden and a homestead and off-grid power. We kind of want a self-contained little area that we can call home when we don’t feel like traveling anymore and have a little bit of space of our own to sort of spread out. Does that include working too? I stood in the kitchen to take this photo of the front of the van. A door between the cab and the living area can be closed for privacy. Bedding is stashed in the area above the wall during the day when the bed converts into a sofa. RTA: Sure! I would love to hear what your plans for work are. Ryan: Right now I am trying to educate myself in coding and web development. It’s pretty much the ultimate way to make money on the road. I have no experience with it, but I’m learning right now the best way that I can go about accquiring the right skills in order to make a decent living while traveling whenever we would like. Samantha: I currently make jewelry and sell it on Etsy, and [I’m] working to maybe expand that from jewelry into something else, maybe even like van-esque accessories…different storage option type upholstery items, potentially. Ryan: It’s definitely a work in progress right now. Ryan: We don’t have a clear, defined future as to what we’re doing. We’re kind of living moment to moment. But in reality, that’s what we signed up for. That’s what we wanted. We spent the last decade of our lives in such a rigid, structured type of life that it kind of turned us off to it. We knew what we were doing every day, and it was the same thing every day, so this [living moment to moment] is kind of the intended experience that we wanted. We’ll figure it out. RTA: So y’all travel with a little guy named Mickey. RTA: Tell me about Mickey. How did he take to the road? Samantha: Surprisingly well. Mickey even before we decided to go for van life, is a pretty well-traveled dog. He’s flown a few times, drove across the country with me. But he is a very relaxed dog, especially for his breed. 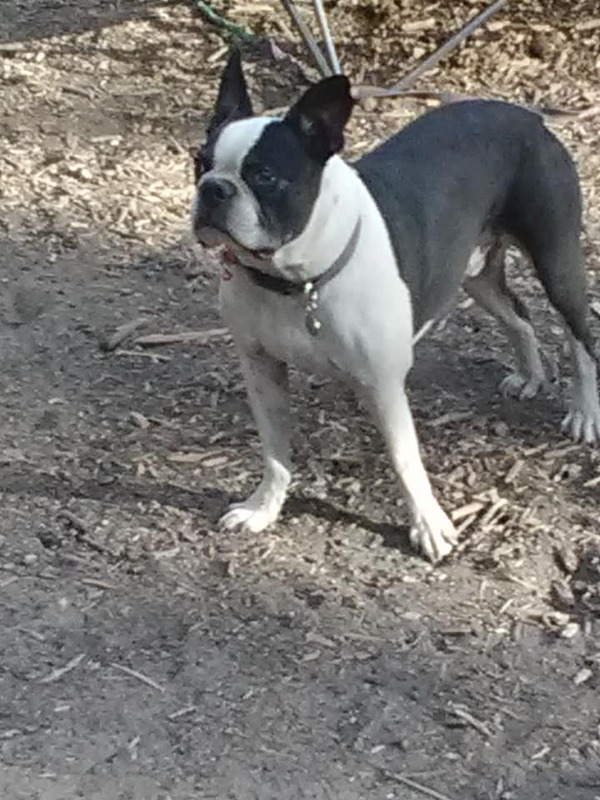 He’s a Boston Terrier. But he’s just happy when he’s with us. As long as he’s with us, he’s pretty much content. Samantha: And he’s got his little space between the captain’s chairs [in the front] and he pretty much sleeps there 98% of the time when we’re on the road. Ryan: He has a modified Temperpedic mattress for his bed. Ryan: Someone was throwing one away, and we just cut a piece off of it. Ryan: and made him one. Samantha: He’s going on eight years old. He’s a bit of an older boy, so he’s pretty relaxed. He doesn’t hike, he doesn’t [laughs] do much of anything except sleep and look cute. Ryan: He walks a half mile and plops. RTA: [Laughs] Do y’all plan to expand your van family by having kids? Samantha: There will be four-legged children in our life, I’m sure, for many years to come, but that will probably be it. Ryan: It was something we talked about not doing before we even started this lifestyle. RTA: What would each of you say is the best part of your life on the road? Samantha: To wake up wherever we want. Ryan: There is no putting a price on true freedom, in my opinion. The ability to just be wherever you want, whenever you want…I’ve never felt anything like it. I don’t want to give it up. Samantha: Nope. Not for anything. RTA: Is there anything else either of you want to add? Ryan: One thing I just want to add is that I had and Sam[antha] had no experience building anything or having any idea what we were doing when we started this, and we created something that we are so extremely proud of. You can see when other people see it how astonished they are about what we built. It’s just, I think, the ultimate example of if you want something so bad, and you actually care about doing it, then you will create something beyond your wildest dreams, something you didn’t even think you could possibly do. I’m just very happy that we did it and didn’t actually listen to other people that thought we were crazy for wanting to do it. If you really want something, you can absolutely do it as long as you care the most out of everyone else.